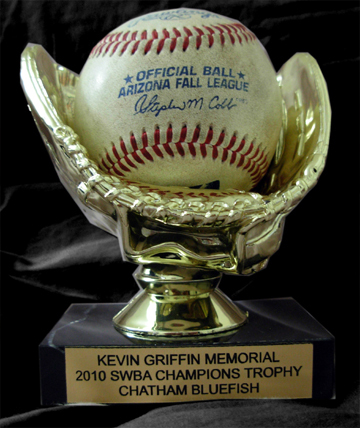 This trophy symbolizes one of the true champions the SWBA has known. Our friend, and fellow owner, would be proud knowing his legacy resides in being a champion. Kevin joined the SWBA in ’93 and for 11 years ran his franchise with a passion and love of baseball. In his time, Kevin had a career record of 1036-811 for an outstanding .560 winning percentage. This is one of the best records during that span. Kevin also won 4 Division titles to go along with his 2 Championships. Kevin, not only succeeded in winning games, but also was a very active member of the league and, by a wide margin, made the most trades during his tenure. As voted on by his peers in the AL, Kevin was named Manager of the Year in ’03 and ’02 as well as GM of the Year in ’01, ’94, and ’95. This league was one of the few things that brought true joy to his life. He felt lucky to be part of the league so he could pursue something so dear to his heart of hearts. We’re lucky to have an owner who forced us to do things better and wiser. Kevin Griffin will always be a Champion of the SWBA.